Two free co-op games for your shiny new graphics card. NVidia has teamed up with Ubisoft to offer two of Ubisoft's upcoming releases for free to anyone that purchases a GeForce 1070, a GeForce 1080, or a GeForce equipped gaming system for the near future. The promotion which launched on February 1st is called the "Prepare for Battle Bundle" and will get you geared up with two of this spring's upcoming co-op games. 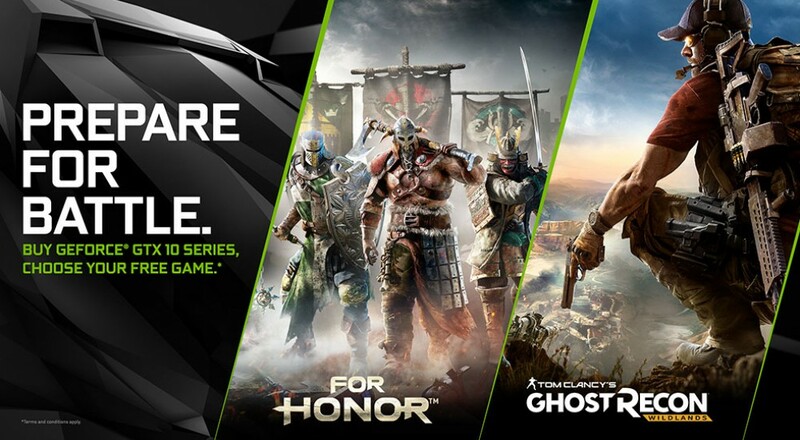 Both For Honor (2 player online co-op), the 3rd person action battle game, and Tom Clancy's Ghost Recon Wildlands (4 player online co-op), the 3rd person tactical game, will be given to you when your purchase any of the above mentioned NVidia GeForce products. You can then redeem the codes for the game inside an update GeForce Experience that links your Ubisoft and NVidia accounts for a more streamlined gaming experience. Also, if you've installed the GeForce Experience lately, you may have been randomly chosen to get into the Ghost Recon Wildlands beta which kicks off soon.